UltraGenda’s mission is to produce the world’s finest IT solutions to support referral and scheduling processes in healthcare, with special emphasis on hospitals, HMO’s and healthcare communities. While our growth and financial performance are important to us, we measure our success just as much by the satisfaction of our customers. 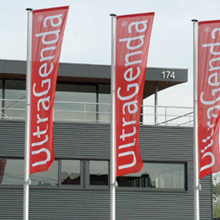 UltraGenda has a reputation for quality, sincerity and reliability. The satisfaction of our customers is exceptionally high. Our customers are primarily large organizations such as individual hospitals, hospital groups or HMO’s. We are active across 10 countries in Europe, but also have a presence in other parts of the world, such as the Pacific and the Caribbean, with a customer list that includes a multitude of leading hospitals. UltraGenda occupies its own state-of-the-art office building, designed by the Belgian architect Hugo Koch.